The time has finally arrived that we offer full support and optimal lineups for FanDuel & DraftKings for the NFL, MLB, NBA, and NHL sports. This feature is already live in the Fantasy Assistant, so go ahead and give it a try. The following examples are for baseball but the same concept applies to all sports. Our projections model has done wonders for traditional fantasy leagues, and now we are offering it up to Daily Cash Leagues for the first time. Our projections provide a detailed account across various categories so you know exactly what to expect from each player. You can sort by a specific stat, salary, best value per point, and much more. Scheduled matchups are also incredibly important when trying to factor in who to start. Players have difficulty ratings provided so you can see exactly how tough or easy each matchup is for the player. As you can see from above, Anibal Sanchez is playing the Tigers, which is a favorable matchup based on the shades of green. Green indicates below the league average and red indicates above the league average. The darker the shade, the easier or more difficult the matchup. As you might expect, we factor in the difficulty of the matchups into our projections model. Arguably the best feature that we offer is the ability to generate an optimized lineup. 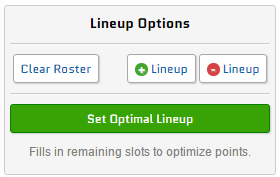 Optimized lineups can be generated at any point in the lineup selection process. You can select one player, no players, or somewhere in the middle and we will fill in the remaining slots to provide the most points. So what are you waiting for? Go ahead and utilize the Fantasy Assistant to create winning lineups.